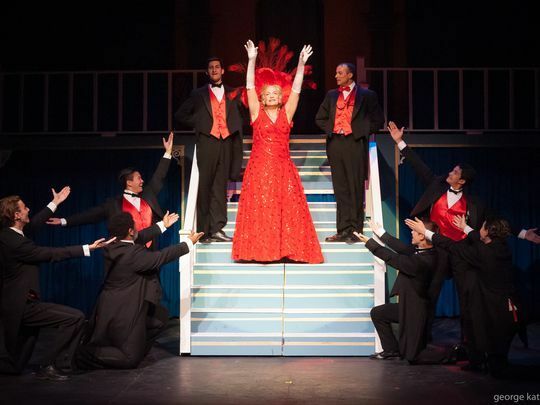 Liz Norton and the company of Hello, Dolly! at Sunset Playhouse. Submitted Photo. Based on “The Matchmaker” by Thornton Wilder with book by Michael Stewart, the show contains memorable and hummable tunes by Jerry Herman, several that even the casual theatergoer would know. The story is mostly that of Dolly, a widow who frequently looks to her dead husband for a sign of how to proceed in life. She has gotten by, to this point, claiming to be an expert on just about everything, but mostly by finding suitable mates for the lonely, including Horace Vandergelder (Glenn Villa), a wealthy widower of whom it is said: “What he really wants is someone steady to clean his house.” While Dolly’s looking for a wife for the irascible feed shop owner, she’s clearly out to claim him for herself. Dolly has lots of tricks up her billowing sleeves in order to snare Vandergelder, including hooking him up with Ernestina Money (Phoebe Albert) at the swanky Harmonia Gardens, which she imagines will not go well. All the vowels hang deliciously in the air as Norton’s Dolly tells Horace that Ernestina has “Eyes as big and round as silver dollars.” Norton has a way of making so many lines equally delicious with her low, throaty voice, perfectly modulated to get the most out of every word. 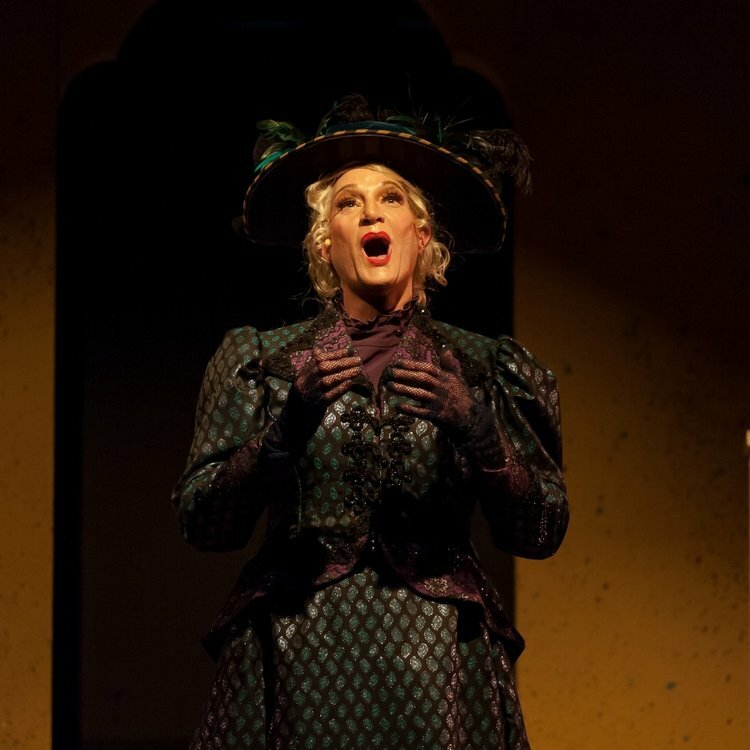 Norton as "Dolly Gallagher Levi" in Sunset's production of Hello, Dolly! Submitted Photo. But there are other charming stories here, most notably that of Vandergelder’s clerk, Cornelius (Eric Welch), and his infatuation with the recently widowed Irene (Briana Lipor), a hat shop owner he meets as he and workmate Barnaby (Shawn Schmidt) play hooky from work to experience NYC. Welch and Lipor are a most appealing and good-looking couple, both with pure, lovely voices and dancing ability. Schmidt is energetic and pairs with Welch in pulling off some fancy footwork. Olivia Burns as Minnie Fay, Irene’s shop assistant, adds some nice comic touches to the quartet. Some of the best moves come from AJ Pawelski and Santana Vannarath during the wonderful scenes in “Waiter’s Gallop,” as they leap and cartwheel their way around the stage in handsome coattails. They are well supported by several other waiters in similar finery, making the “Hello, Dolly” scene truly a centerpiece. But everything comes back to Norton as Dolly. She makes her entrances grandly in outfits with more material than your grandmother’s living room draperies and hats as big as end tables and wears them with the comfort and ease of workout clothes. The spotlight loves her, and she returns that affinity with an inimitable, engaging style. Villa, as Horace, is suitably cantankerous. The sparks fly in his scenes with Dolly, which is especially comical in his dinner with the overbearing matchmaker. Under the direction of Mark Mrozek the most pleasant music is full and clear, while dance captains Becky Cofta and Pawelski have the troops keeping nicely in step. 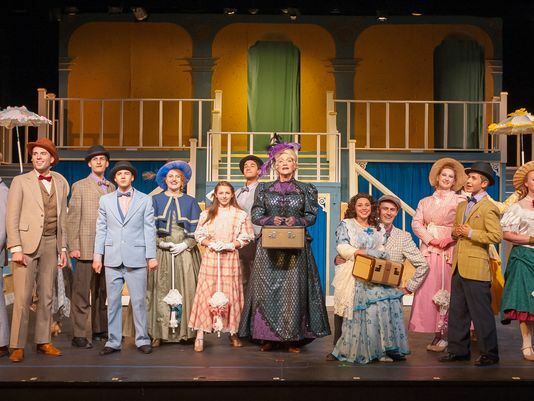 “Hello, Dolly!” is a joyous celebration from start to finish. Every tune is upbeat, romantic or comical. Every scene is a delight. Sunset has captured everything that is wonderful about the show for a truly entertaining evening.